She was carried to the river by her sisters, singing, we all come from the goddess, unto Her we shall return, over and over again we chanted. I stepped forward, looking into her eyes, speaking the words, are your ready to be reborn, are you ready to be reborn, are you ready to be reborn. She speaks, Yes Yes YEs! I pull her black torn velvet dress she wore at her prom 40 years ago over her head, then removing the white cotton underwear! I walked into the emerald green waters, holding my hand out to her, I said come my daughter, it is time, to give to the running waters the shame, the sorrow, the sadness, the abuse, the betrayal, the loss of your sacred sexual body. 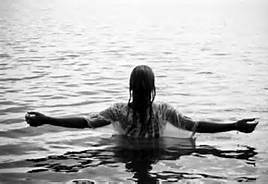 Today, you give to the waters an ancient story that does not belong in your cells any longer. You were sacrificed as your mother’s mother’s, mother’s were. For how could any of us remember the Ancient mother, when She was taken from from us thousands of years ago. Then our mother’s became the prison guards for the patriarchal regime, to enlist us to believe if we were good girls, obedient girls, we would get the prize of a man! We could then leave our father’s house, to be owned by our husbands. But, I promise you, I know She, the Great Mother, the wild one who will never be controlled or contained lives in our bones, our breath, our breast, our vulvas. We gave birth to those Solar Gods, to those Sons of Light. Those gods came through our legs, smeared with the sacred blood of the Mother. Without our blood, nothing would exist! Bones, Stones & The Crone – A Day of Ritual, Expressive Arts & Celebration to honor the wisdom of the Crone! Longing to Belong – Belonging to the Longing! The Power of Divination and Ritual!